Villa Olivia is our home from home in Spain and, as such, is much more than a typical rental. The house is perched on a hill below Frigiliana, our local white village,with stunning views down to the valley to the sea. It has 5 bedrooms, 3 doubles and 2 twins, all with air-conditioning or ceiling fans, and four bathrooms. The wide expanse of pool terrace features a 17 metre walk-in swimming pool, which is ideal for those morning lengths. We provide sun beds for 10 people as well as tables and chairs. There are two further terraces and three maintained garden areas, laid to lawn with a range of bougainvillea, hibiscus, fruit trees and plenty of shady spots. Al fresco dining is the order of the day, as the kitchen window opens outwards onto the main terrace, to form a bar, where there is seating for 10 and a new gas barbecue. There are adjustable blinds to achieve any level of shade you might need to ensure the ice in your Gin & Tonic does not melt. If you fancy lunch by the pool, there is a built-in barbecue on the pool terrace, as well as a fridge and sink. The house is equipped with free wi-if and UK main channel TV. There is also a DVD player with an extensive library of titles, a music system for CDs and a full bookcase. We have a local property manager who maintains the pool and is available to solve any problems or carry out any minor repairs. We provide a book of instructions, which tells you all you need to know about how things work and gives recommendations of local sights, restaurants etc. Come and see the view. You won't be disappointed. Despite arriving in a storm Villa Olivia lived up to expectations immediately, with beautiful gardens set in a quiet road. Once inside we found that it was spotlessly clean and well organised, making us feel at home. Having enjoyed many villa holidays over the years, with family and friends I would say that Villa Olivia distinguishes itself by its perfectly equipped kitchen, comfortable furniture, beautiful views and a great sized pool. We had a relaxing, fun holiday. 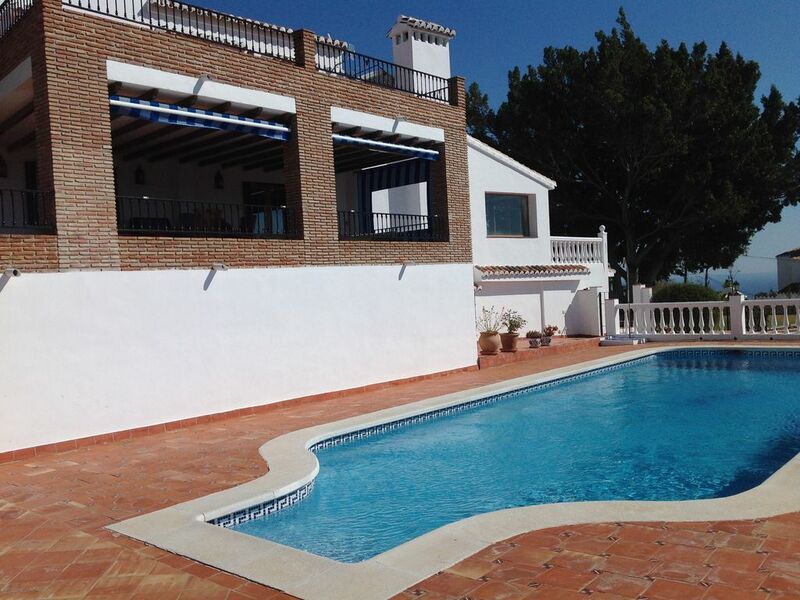 Lovely property, beautiful views, fantastic pool and a wonderful place for a family holiday! Frigiliana isa five minute drive for a beautiful historic town and Nerja just a ten minute drive for a great family seaside resort and lots going on. Could be slightly improved by adding air con to the two downstairs bedrooms. Beautiful villa, perfect for a family holiday. Everything about this villa suited our family perfectly. It has a great pool, lovely views and in a very quiet residential area. Best villa we've stayed in, would highly recommend it. Villa was bigger and much better than we expected. Pool was excellent as we're all the facilities. Felt like a home from home. Convenient location for both Frigliana and Nerja. Only negative would be lack of air con in 2 downstairs bedrooms, but it was very hot when we stayed. Excellent villa & holiday. No hesitation in recommending this property to everyone. Amazing views. Fantastic villa equipped with everything you could possibly need. Couldn't get the children/adults out of the pool. Everywhere spotlessly clean from outside terraces /pool area /bbq area/interior. Gardens were extremely well kept and maintained. All in all an exceptional villa & location. Hope to be back soon!!! !